Interest in commercial vans to replace traditional service trucks continues to grow. Sales figures provided by the NTEA (National Truck Equipment Association) show it’s a trend that is not fading. Growth has been sustained over about a 5-year period, and the reasons for this are clear. Safety: An enclosed vehicle provides theft protection that a truck simply cannot. Concerns about material and tool safety can be addressed by locking the door, rather than having to take everything with you, or keeping a close eye on your vehicle while you grab a quick lunch. Weather protection: If your cargo can be damaged by weather, or weather makes getting the job done a bit more challenging, the enclosed space of a van is ideal. Fuel-efficiency: If you don’t need to go off-roading to get to your jobs, vans tend to have less power than trucks which means savings at the pump. Cost: Vans typically cost less than trucks with service bodies, which is great for any budget. Power: Vans have less power than their truck counterparts, which can be an issue if you have large loads to haul, or if off-roading is required. Smaller cargo size: Because of the four walls, you simply cannot fit as much in a van as you can in a truck. 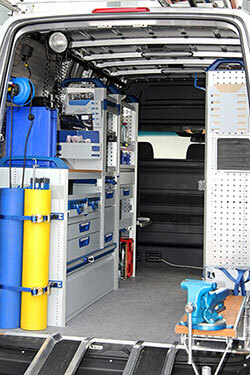 Upfitters and equipment manufacturers are beginning to understand this challenge and are building van-specific solutions. Safety: While a van is great for theft protection, it presents other issues. In particular, air compressor installation is challenging because most air compressors are designed for trucks. Workers face challenges of proper ventilation, or moving a heavy piece of equipment in and out of the van cargo area for every job. Both present potential safety issues, though there is an engineered solution. Over the coming months, we will take a deeper look at the issues and opportunities in the growing van market and how they can positively impact your business. If you have any questions about this article or anything mobile compressor related, please contact us.